The last time we talked, we were just starting a series on the basics of Walt Disney World. Today, I want to talk a little bit more about the basics, “Where to Stay”. OK, so you have nailed down the best time to go, now it’s time to start planning. Where in the “World” could you stay?? The first thing we probably need to discuss is staying on “property” or off “property”. What do I mean by that? There are more than 20 unique resort hotels right on Disney property. So, what are the advantages to staying “on property”? Like with all things, Disney’s quality service doesn’t stop at the turnstiles to the parks. You can expect the same Disney touches right in their resort hotels. And, so you will be able to maximize your time in the parks, on most days one theme park will open early, or stay open late. These Extra Magic Hours are available to Disney Resort hotel guests only. When arriving at Orlando International airport, you can skip baggage claim, and take advantage of Disney’s Magical Express service. This service provides complimentary transportation for you, as well as luggage delivery service right to your resort hotel room. While staying at your Disney Resort hotel, you could also make your way to all 4 theme parks, 2 water parks, and the Downtown Disney shopping district via Disney’s complimentary transportation system. The options include monorails, ferryboats, and motor coach transportation. Not interested in using Disney’s transportation? Rather drive yourself? Disney also provides free parking at all of the theme parks, to all resort hotel guests. Did you pick up something large and bulky? Don’t feel like hauling it through the parks, and all the way back to your hotel? Not to worry, Disney has you covered. 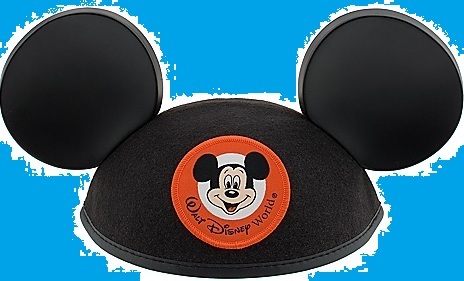 Many of your purchases can be delivered right to your Disney Resort hotel. Worried about traveling through the parks with a large amount of cash, or credit cards? While staying at a Disney hotel, you can charge that large bulky item directly to your room. While at your resort, watch for opportunities to catch a movie under the stars, experience a Character Dining Meal, or visit the resorts child activity center. (All of these available at select resorts). By booking a package, and staying at a Disney Resort, you will also be able to take advantage of the very popular Disney Dining Plan where you can save while enjoying a variety of dining experiences. So, doesn’t it cost a fortune to stay at a Disney Resort? Luckily Disney offers a wide array of options to fit any budget. Disney classifies their resorts into one of several categories. Resorts in this category range from a typical standard room that sleeps 4 (about 260 square feet) to family suites that can sleep up to 6 (about 520 square feet). The distinctive characteristic in these resorts is the larger than life icons you will find throughout. They also offer you an experience big on fun, but small on cost. Art of Animation – Disney’s newest resort invites you to become a part of your favorite animated films. Pop Century – Whether it’s larger-than-life Cell Phones, Rubik’s cubes, or Big Wheels, you will find it here. You will feel like you stepped back in time at this fun resort. There are a vast array of room options available within this category. Standard rooms range from about 340 square feet, and can go up to around 440 square feet. No matter the option, you can experience the ultimate in luxury, style and service at each of these Deluxe resorts. Wow! That’s a lot of places! As you can clearly see, there are so many options to choose from! Interested in hearing more about any of the Walt Disney Resort hotels? Drop me a line. I look forward to hearing from you. So, you have decided that it is finally time for you to take your little Pirate or Princess to the “Most Magical Place on Earth”. But now it’s time for the decisions to be made. When is a good time to go? Where to stay? How many days do I need to be there? What is there to see? Wow! The possibilities are endless!! Never fear! I’ve come to help. So, let’s start this off with one of the main questions that I’m asked…. Well, the answer to that is a resounding….”It depends”. What?! It depends?! That’s right. It depends. Let’s take a look at some of the factors involved in timing the perfect trip for you and your family. Holiday Seasons, “What are the Parks like during the Holidays? Does Disney do anything special?” – OK that one is a little crazy….If there is one thing that Disney does well, it’s “Special”. Especially at the Holidays! So, let’s start with Crowds. The general rule is, if kids are out of school, expect larger crowds in the Parks. Most parents try to avoid taking their children out of school to go on vacation. OK, so that’s summer, right? Well, not necessarily. Families tend to travel any time their kids are out of school. That also means all major holidays will show larger attendance numbers. Just as you would imagine, the summer months are among the busiest. But if you look, even busier than the summer are the holidays. From President’s Day in February to Spring Break/Easter in the spring, to Thanksgiving, Christmas, and New Year, the holiday periods are among the busiest days of the whole year. So, if you are looking specifically to avoid the crowds, and have the luxury of traveling while kids are in school, it looks like September, or early December would be right up your alley. While crowds are a factor, how about temperatures? If you are someone who doesn’t mind crowds, but can’t stand the heat, when are the best times for you? If you are someone looking to avoid the heat, you will want to stick to the October – April time frame. During this period, highs are generally in the mid 70’s to mid 80’s. On the other hand, if you will be spending your evenings in the Theme Parks, or enjoy the pools or Water Parks, perhaps lows in the 40’s and 50’s might be a little chilly for you. Keep in mind that these are averages, and as a wise man once said, “Averages are only the mid-point of the extremes.” What does that mean, who knows. It sounds good though. 🙂 Actually, what it means is although these are averages, weather is unpredictable and you may be faced with an “extreme” condition. A few years back, my family traveled to Walt Disney World the first week in December. Coming from Ohio, we are used to cold winters. While attending Mickey’s Very Merry Christmas Party, they were pumping in fake “snow” on Main Street. While we knew it was fake, we had to stop and think about it because we were freezing and thought for a second that it could actually be real. OK. How rainy is it in Florida? Will all of the “magic” be washed away? As you would expect, the summer months generally see the most rainfall. The good news is, even in the summer, the rain doesn’t last forever. In most cases, the rain passes fairly quickly and you can move on with your day. If you are looking to avoid that possibility, however, Spring, Fall, or Winter may be the time for you. While we all know that Disney doesn’t do anything unless they can do it “special”, there are many special events that are run all year long. The holiday season is among the most magical time to be in Walt Disney World. There are many families that plan their annual trips around the holiday season solely to experience all that Disney has to offer during this amazing time. Are you a runner? If so, Disney has something for you. Several times a year, Walt Disney World plays host to thousands of runners as they compete in several endurance challenges. So, all this to say, “What time of year is the best time to go? It depends.” One thing is for certain, no matter what time of year you choose for your family, there is so much to see and do. You will have a wonderful time! Interested in hearing more about any of these events, or planning out the perfect time for you and your little Pirate or Princess to be part of the magic? Contact me today for your no obligation quote. And, make sure you stay tuned for the rest in the series, Walt Disney World – The Basics. See you soon! The grand opening for the New Fantasyland expansion at Magic Kingdom Park at Walt Disney World Resort will take place on Dec. 6, 2012! Attractions included in this opening are Under the Sea ~ Journey of The Little Mermaid, Be Our Guest Restaurant, Enchanted Tales with Belle, Ariel’s Grotto, Gaston’s Tavern and Bonjour! Village Gifts. Previews of these attractions will begin earlier, on Nov. 19. Don’t Forget! You can save up to 30% at select Walt Disney World® Resort hotels during the late summer period. Book through Aug. 14, 2012, for stays most nights Aug. 15 – Sept. 29, 2012. For example, you can stay in a standard room at Disney’s All-Star Sport Resort starting at just $70 per night, plus tax, for most Sunday through Thursday nights Aug. 15 – Sept. 27, 2012. That’s a savings of 20%! Just add Theme Park tickets and you can take advantage of all the late summer fun. What in the world is that, you ask?? So, how do you celebrate a ridiculous, made-up, never before heard of event?? Of course you break out all of your Disney gear, and wear nothing but Disney Shirts, Mickey Ears, sandals, and shorts to work. You listen to nothing but Disney music at home, work, in the car….. If you haven’t already started an official countdown, now is the time to do it. Nothing makes the final days move faster than marking them off the calendar. There are many different ways you could choose from to do your countdown. Some people make construction paper chain links. Each night your children (or you, I promise I won’t tell) can tear off a link at bedtime. It’s a great visualization for younger children to get an idea of how many days are left. Others may choose to do something more elaborate, like creating a wooden countdown peg board with mini Mickey heads with the numbers 0 – 9 on them. Each day, they could change the date. Although this approach would take some time to set up, it would be a fun craft for the family to work on, and you could use it year after year. We typically print calendars that count down the days. On the day we travel, I print a little mickey image. The kids look forward to marking the days off, and at any point, if you ask them, they can tell you EXACTLY how many days are left. Then, of course there are electronic countdowns including several apps for the iPhone. We generally take this opportunity to get our Disney nerd on. This is when we break out all of our Disney music and Disney themed games. Now is also the time to watch Disney movies and home movies from past trips. Time to reminisce by looking over pictures and scrapbooks from days gone by and anticipate making new memories. While this time can certainly be fun, it can also be stressful. There are many things to remember to take care of, a list of things to do, and thousands of things to pack. Check the Orlando Weather – this may assist in what exactly to pack. Confirm all your reservations – Airline, Hotel, Car Rental, Dining – better safe than sorry. Make sure you do the laundry you will need while on vacation – You don’t want to be doing it the night before. Charge the batteries for your Camera, Video Camera, iPod, GPS, etc. Pick up some Disney Gift Cards – this is a great way for the kids to feel that they “paid” for their souvenirs. Enough of the “Necessity”, I want FUN! OK. I’ll end with some things you can do to keep the excitement going over the last week or so. Now is the time to make sure you have your itinerary locked down. We always begin with what parks are we touring on what day. From there, we make a list of the “must-do” attractions. These are ones we want to make sure we see. Now, starting with this list, we make a list of the first 3 – 5 attractions we want to see when we arrive at each park in the morning. Nothing is worse than taking the time to jump out of bed at the crack of dawn so you can beat the crowds, then upon arriving at the park standing and staring at a map trying to figure out what you should do first while the masses head to the attractions. With these thoughts in mind, I’m sure you can have a magical experience. Are there things you do to prepare for your trip that I didn’t mention? Rituals that your family has as your vacation approaches? I’d love to hear them! So last week we had an exciting mail day! I know…I know. Really? Mail? Exciting? Doesn’t mail just mean bills, catalogs, credit card offers, and other junk? Sure…usually. That day, however, was one of those rare days when you get something special. You immediately run to the house to show your spouse. So, what was it that caused today to be one of those days, you ask? Ok, I still don’t get it. What exactly is that? Well, I generally look as this little packet as my “passport to happiness”. It is the travel vouchers and luggage tags from Disney’s Magical Express, needed for my upcoming trip (16 days, but who is counting) to Walt Disney World. Receiving this in the mail each time we travel is, in my book, a vacation milestone. Once I receive this, I know that my trip is imminent, and I can start to get excited and start the official countdown. Not familiar with Disney’s Magical Express? If you are staying at one of Disney’s resorts during your vacation, Disney provides complimentary round-trip shuttle service from the Orlando International Airport. Disney’s Magical Express also includes luggage delivery. 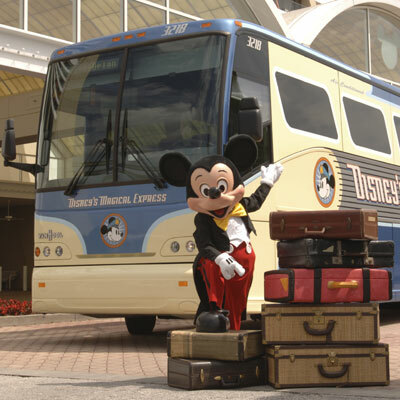 By using this service, you can step off the airplane, and head directly to the Magical Express bus for your transportation to your Walt Disney World Resort hotel. There is no need to wait for, or transport your luggage. After you have secured your flight arrangements, contact your Vacation Planner (me of course 🙂 ) with your flight info, or of course if you have decided to do something crazy like do all of the planning yourself, and not use my services, you can contact Disney directly to reserve your spot on Disney’s Magical Express. Approximately 3 weeks prior to your departure, Disney will mail you your very own magic envelope (and you too can begin celebrating). Inside the envelope, you will find your travel vouchers and luggage tags. When you are checking in at your departure airport, make sure that you have attached the luggage tags to your bags. If you do this, you won’t have to worry about your bags again. The next time you will see them is when they are delivered to your room at Walt Disney World. An important side note here. When packing, make sure you pack your travel vouchers in your carry-on bag. 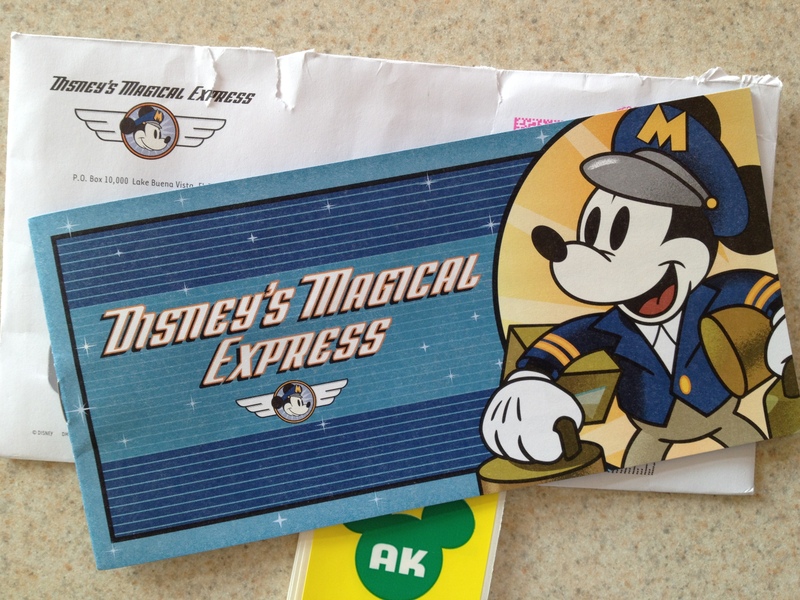 You will need these vouchers in order to board the Magical Express motor coach. Now, back to your trip…. When you arrive at the Orlando International Airport, you can pass right by the baggage claim area, and make your way down to Level 1 of the Main Terminal (B Side). At the Magical Express check-in, they will check your vouchers and direct you to board the correct motor coach. Now, all you have to do is sit back, relax, and let your vacation begin. As you travel on board the motor coach, you will be treated to a cute video that will give you all the highlights of Walt Disney World. This is one of our family favorites, and something we look forward to each trip. To me, it is the official start of vacation. Disney’s Magical Express will transport you to the front door of your resort. All you need to do is check in, and start soaking in all the Magic. But wait, what about your luggage ?? Disney’s Magical Express service will collect your bags and deliver them directly to your room within 4 hours of the time you check in at the resort. Something else you will want to keep in mind is since you will not have your luggage with you when you check in to the resort, you will want to make sure that you pack anything that you will need for the first couple of hours in your carry-on bag. (Medicine, park tickets, reservation numbers, etc). So, on your next trip to “the World”, don’t stress out about transportation from the airport. Sit back and let Mickey handle the driving! Have questions, or comments? Feel free to contact me. On this day, 236 years ago, Congress adopted the Declaration of Independence. In all 56 individuals, two of them future Presidents (John Adams and Thomas Jefferson), signed that document. Some of the signatures didn’t come until years later. And because of the courage of those “Founding Fathers”, the greatest country in the world was born. 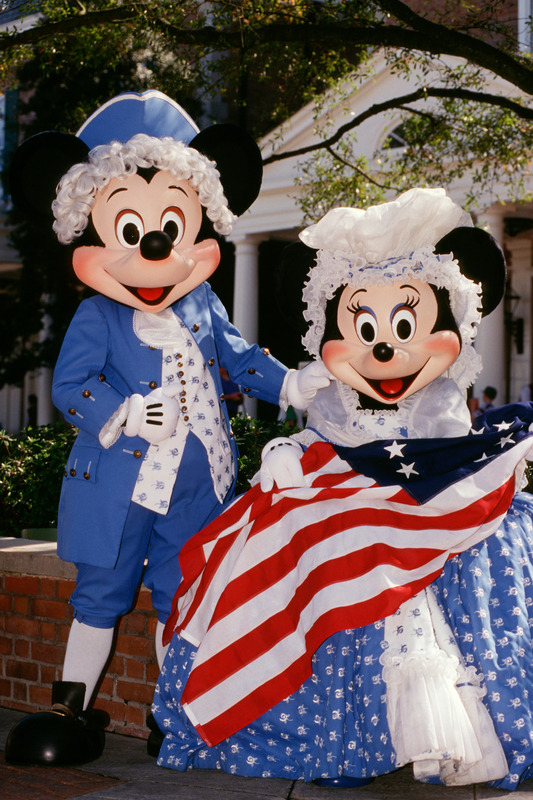 Walt’s love for the United States of America, is evident even inside The Magic Kingdom. Starting as you pass into Liberty Square from Cinderella Castle in the central hub, you cross a bridge that was inspired by the Old North Bridge. The Old North Bridge is the site of one of first battles for American Independence, the Battle of Concord. As you continue through Liberty Square, you will pass by a large oak tree. The Liberty Tree, was transplanted and moved to Walt Disney World. The 130 year old tree weighed 38 tons at the time, and had a root ball about 18 ft x 16 ft x 4 ft deep. The tree symbolizes the original liberty tree in Boston, Mass that was the gathering spot for a group of individuals called the “Sons of Liberty”. Hanging in the branches of the Liberty Tree, you will notice 13 lanterns, one for each of the original colonies. Next to the Liberty Tree is a replica of the Liberty Bell. In fact, it is the only replica to be cast from the mold from the original Liberty Bell. Across the walkway from the Liberty Tree, you will find the Hall of Presidents. The Hall of Presidents, a 22-minute show inside the hall features audio-animatronics versions of each of the 44 Presidents of the United Sates. Well actually, only 43 of them since Grover Cleveland served two separate terms as President (22 & 24). Throughout the show, you will see each of the Presidents gesture, sway, sit, stand, and in some cases speak. The show is well worth your time. If you look closely in the windows of the Hall of President, you will see two glowing lanterns. These lanterns are meant to represent the beacons that Paul Revere watched for as he made his famous ride announcing the coming of the British army. The shutters on the buildings hang crooked – During the Revolutionary War, Britain was still sending supplies to the colony, but obviously would not send them ammunition. What they did provide, however, was shutters…with metal hinges. Resourceful Independence fighters stripped the hinges from the shutters and melted them down to make musket balls. They replaced the metal hinges with leather straps. As time went on the leather stretched out, causing the shutters to hang crooked. To keep up with the themes, since during Colonial times there was no indoor plumbing, you will find no bathrooms in Liberty Square. This is sort of a technicality, however. There are two restaurants in Liberty Square, Columbia Harbour House, and Liberty Tree Tavern. Although each of these restaurants have bathrooms, they are technically across the line into the next “land” in the Magic Kingdom, so don’t physically sit within the borders of Liberty Square. There are a couple of other hidden gems in Liberty Square, that I won’t tell you about, you will have to discover them for yourself. (If you really want to know, I’ll tell you if you ask nicely 🙂 ). If you would like to hear more about Liberty Square, the Magic Kingdom, or Disney in general, drop me a line. I’d love to hear from you. (If you are interested, I’ve also included several links for you to check out). In 27 days (but who is counting) we will be returning to one of my favorite places in all of Walt Disney World! Animal Kingdom Lodge! As you pull up in front of the resort, you can tell that something is different about this place. Not only is it the size of the place, it just has a different feel to it. You can’t quite put your finger on it though. When you step out of the car (or usually in our case, the Disney Magical Express bus), you feel so completely enveloped by the sights and sounds. (If you listen carefully, you can hear African-themed music playing in the background.) You don’t know quite what to expect. You walk up to the front doors, and as they open, you start to get a real appreciation for the size and scale of this resort. As you step through the front doors, you will most likely hear a collective, “Wow!” coming from those who walk through the door with you. 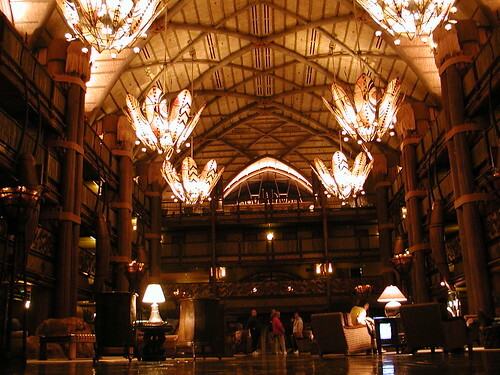 Animal Kingdom Lodge, an African-themed deluxe resort at Walt Disney World, opened in 2001 and hosts more than 1,300 rooms. The resort boasts thatched ceilings, large beams and showcases many real African artifacts. The lodge is situated in a way to allow for an expansive view of the 43-acre African Wildlife Preserve. If you pass through the lobby, you will step into an area called Arusha Rock. It is a rock platform that gets you up close and personal with the wildlife roaming the savanna. 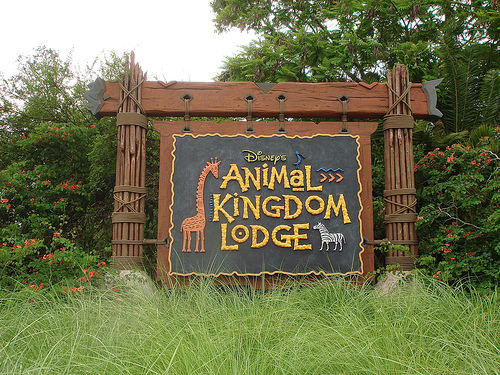 Animal Kingdom Lodge wouldn’t be called that without the animals! More than 30 different species of wildlife roam 4 different savannas. Among the animals that call this place home are, Reticulated Giraffe, Zebra, Antelope, Okapi, Thompson’s Gazelle, Ostrich, and White-Bearded Wildebeest. One of the greatest things about the savanna, however, is the fact that many of the rooms come with views of the savanna. It’s a wonderful thing to be sitting on your balcony and see a Giraffe wander by. Sometimes they feel close enough to touch! The last time we stayed there, we had the pleasure of two giraffe coming over just under our balcony and bedding down for the night. It was a breathtaking sight. And, if you are really ready for an up-close view of the animals, you may choose to reserve a spot for a tour of the Wanyama Safari. This is an adventurous guided drive through one of the safaris that offers the opportunity to spend some time with the members of the Animal Kingdom Lodge animal program team. 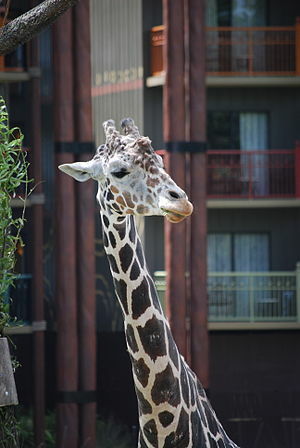 You will enjoy wonderful photo opportunities of the animals and architecture of Animal Kingdom Lodge. After the safari, you will return to Jiko (one of a few restaurants at the resort) for an amazing dinner. Speaking of restaurants, Animal Kingdom Lodge offers two award-winning restaurants, Jiko-The Cooking Place and Boma-Flavors of Africa, as well as a The Mara, a counter service restaurant. If the adventure with the animals is too much for you, or you are just looking to kick back, you could also choose to relax at the resort’s 11,000 square foot zero-depth entry pool. Uzima pool also offers a 67 foot long slide. With all of this and more to offer, Animal Kingdom Lodge is an amazing place to stay, and would be a wonderful choice for a family stay at Walt Disney World. Good news! Disney Cruise Line® has opened bookings throughout 2013, as well as revealed where two of its ships will homeport late next year – Disney Magic® in Miami and Disney Wonder® in Galveston. As previously announced, Disney Fantasy and Disney Dream will continue to sail a variety of Caribbean and Bahamian itineraries in 2013, departing from Port Canaveral.